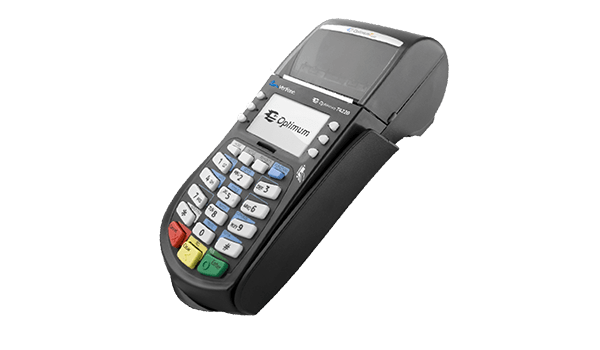 The Hypercom Optimum T4220 is a powerful IP POS terminal that is ideal for both small and large businesses. Fast, functional and user-friendly, the T4220 serves to enhance customer engagement and satisfaction, while providing a hybrid of excellent security and performance. This reliable piece of equipment will save time and give business owners a peace of mind. It is equipped with a large memory, long lasting battery and flexible communications options. The brightly coloured keypad is water splash-resistant, and the bright, white backlit display provides maximum visibility and clarity. The screen supports graphics with a clear resolution, creating a more interactive transaction experience. True to its name, the T4220 is the optimum IP credit card terminal. With a fast processor and industry-leading software supporting its slim design, this handy tool is capable of evolving as market requirements change and grow. The keypad accommodates for visually-impaired customers, and the printer is designed to eliminate paper jams. Forward thinking and practical, the T4220 is the modern solution. As trusted, global POS terminal suppliers, Firemane is committed to providing the latest products at the best prices. Get in touch to enquire about ordering refurbished and used Hypercom Optimum T4220 POS machines in bulk. All refurbished terminals come with a 12-month warranty.